Industrial control of dust is accomplished by fan air velocity that captures and moves the dust to dust collector, such as a cyclone or cartrifge dust collector. Fans installed on the "clean side" are the most efficient when using backward inclined or even airfoil fan wheel designs. These fans also have a non-overloading power flow vs fan static pressure curves - ideal for dust collection systems. 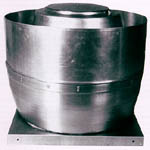 Fans handling "dirty air" typically use less efficient radial fan paddle wheels. These fans are ususally abrasion resistant. Cartridge dust collectors and small cyclone dust collectors require compact, direct drive fan / blower designs that fit into confined spaces. Industrial Fan Co. roof exhausters is a motor driven power ventilator and is furnished with durable weather proof exhaust hood. This is ideal for extraction or air supply through the roof, usually preferable in different manufacturing facilities, steel plants and foundries.